Rand Paul is a dangerous man. The thing is it’s difficult to tell whether the Freshman Senator from Kentucky is more dangerous to the Left or the Right. Inarguably, he is dangerous to The System, for if nothing else he isn’t screwing around. He means to slash and dash the federal government by tying its purse strings and thus shrink it way past anything Ronald Reagan ever dreamed. The Gipper, like all poser fiscal conservatives, especially the newly minted Republican legislators, had not seen anything like Rand Paul. Certainly those who disingenuously rode the wave of the Tea Party angst won’t be able to stand idly by and allow this man to begin chipping away at policy with a zealot vehemence that would make Newt Gingrich look like a welfare freak. And although Democrats may casually dismiss him as a libertarian nut, they will also have public relations issues with a coyote sniffing around their usually manageable hen house. Apparently Rand Paul wasn’t merely piggybacking the anti-government groundswell of 2010. He was damned serious. And now that 2011 begins with him on the inside, he’s going to stand on principle, at least for the time being. This is nothing Republicans want to hear, fearing another 1995 disaster when a landslide of GOP support went sideways fast. Soon Big Bill Clinton was being sworn in again. Running through the halls of congress with an economic battle axe runs counterpoint to what the Republicans have in mind; take a lot of useless congressional votes, blame the Democratic-controlled Senate for their failures, and subsequently get rid of Barack Obama so they can go back to running up the debt on some other asinine war or massive Medicare handout. And if he has to, Paul will go it alone. For instance, on February 3, Paul was the lone dissenter against a bill that would outlaw citizens from aiming laser pointers at aircrafts. This is akin to an innocuous “no torturing puppies” piece of legislation. But Paul was opposed, agreeing it a sound safety issue but also pointing out that many states already have such laws on the books and should decide for themselves on the length and breadth of the “regulation”. This of course parallels Paul’s intellectual argument against certain aspects of the 1964 Civil Rights bill that became something of a public embarrassment for him during his campaign. After the obligatory backlash, Paul eased up on his original disagreement that any private enterprise be forced to comply with federal laws to serve patrons it felt unfit for service, namely African Americans. Although months ago we dissected the issue as a goofy professorial discussion on States vs. Federal rights and not blatant racism, there seemed to be a disconnect with Paul’s ability to distinguish between core philosophy and plain governance. To Paul, people seem to muck up the works with their silly needs and messy gray area interpretations. This kind of character tends to scare the hell out of professional politicians, happy to skip around the edges and pay lip service to facts. You see, Paul is a wonk, a geek, a stat nerd with nary the bombastic personality of a Gingrich or the plastic charm of a Reagan. He comes on as a robot, unwilling to deal in emotional or endearing aspects of issues. 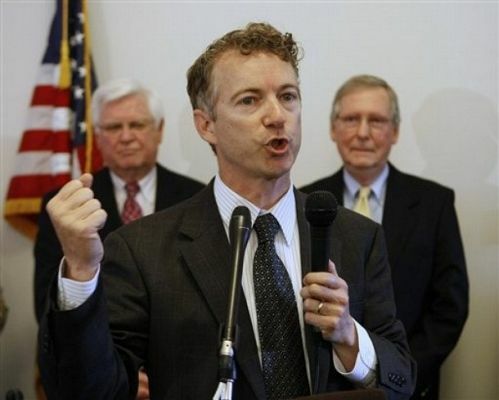 It is numbers; deficits, surpluses and how to best control them that moves Rand Paul. To Paul, people seem to muck up the works with their silly needs and messy gray area interpretations. This kind of character tends to scare the hell out of professional politicians, happy to skip around the edges and pay lip service to facts. It is never about where your tax dollars are spent for Rand Paul, only the reasons to spend it. And he sees very little reason to spend it anywhere. It is this no-nonsense dedication to reducing the power and expanse of the federal government that Paul brings his $500 billion plan to congress. With proposed cuts to the Departments of Agriculture and Transportation removing $42 billion and further reductions to the Departments of Energy and Housing and Urban Development of approximately $50 billion each, the bill also includes removing education from the federal government’s jurisdiction, allegedly creating an almost $80 billion in cuts. As predictable as it is that a fiscal conservative would choose to beat on Agriculture, Energy, Transportation and Housing and Urban Development, Paul doesn’t stop there, proving his libertarian mettle and that he’ll not renege on reducing government ala Regan and the last Republican president or even the Gingrich Republicans of a generation ago. Paul’s bill takes aim at the usual Republican spend-thrift strongholds like international aid, Homeland Security and the Defense Department. Balls. That’s what it takes to go where Paul is going, where no one elected to congress as a member of either party has gone in our lifetimes. But even Rand Paul’s balls have their limits. His proposed $500 billion in cuts, which he stoically calls “just getting started”, would keep 85 percent of the federal government churning out the entitlements; namely Social Security or Medicare. Not even a true maverick like Paul would dare touch the untouchable, but Rome was not taken down in a day. It is unlikely Rand Paul will get any of this past the committee stage; much less a vote in the House or the Senate, but it will be worth watching. His stand will be also worth discussing in the coming year as the initial grass roots tremors against government spending and tax issues fade into what is sure to be the expected “Patience is a Virtue” pitch the Republican-controlled House will hide behind. It appears as if Paul will stand virtually alone against the raising of the debt ceiling, which is approaching rapidly. That’s when we’ll find out where Paul’s enemies reside; Left or Right.